The subject is incoming international mail from the United States, circa 1933, from a "Mr. R. B. Preston" Schenectady, New York. Mr. Preston appears to have send underpaid letters to himself c/o of The Postmaster of various locations, in this case Jesselton. 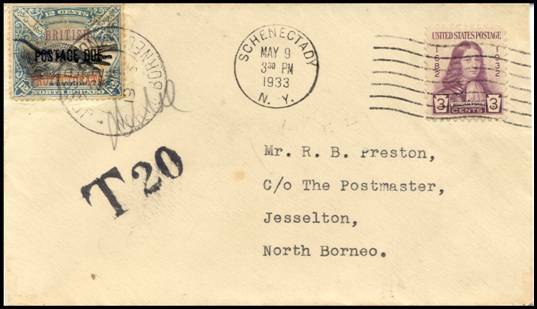 The letter is stamped "T20" and franked with a 12 cents green and black N. Borneo postage due (British Protectorate overprinted) tied to the cover with a Jesselton North Borneo CDS, dated 22 Jun 1933, and signed with a pencil signature. 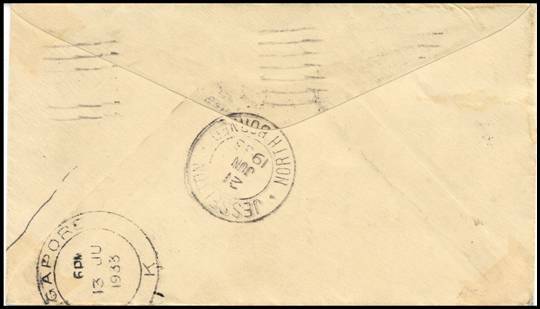 Backstamps are Singapore K and Jesselton North Borneo, 21 Jun 1933. Why the T20 and only 12 cents postage due affixed? Why postage due at all and how was the fee collected when the cover is addressed c/o The Postmaster? Are these covers from "Mr. R. B. Preston" known elsewhere? Thank you -- any additional information is greatly appreciated.